Very few manga have the staying power to remain in print format in the US. Sites like Crunchyroll cater to those who are looking for legally available licensed English translations, but with the legal grey area that surrounds scanlations and the many many sites that host them any company licensing a print version of a manga is making a huge gamble. Can they sell enough copies at Barnes and Noble or a local comic book shop to make their money back? And if a title is doing well in print can the individual volumes continue to be released, are new editions warranted or is an omnibus necessary? 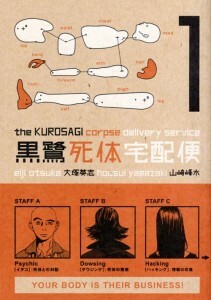 “The Kurosagi Corpse Delivery Service” is one such manga that has proven it can continue to sell both as individual volumes and as an omnibus. Why is this the case? 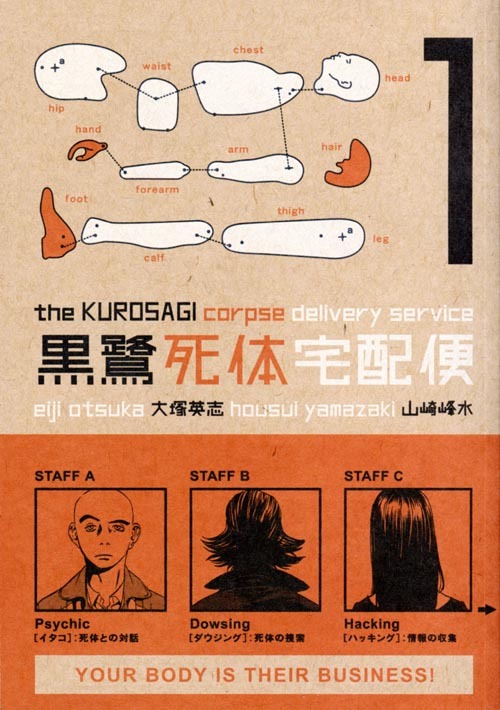 Well, this week I intend to take a look at the appeal of The Kurosagi Corpse Delivery Service vol 1 omnibus and see what the fuss is all about. “The Kurosagi Corpse Delivery Service” follows the “Cowboy Beebop”-esque adventures of 5 students at a middle-of-the-road Buddhist university. You have your main protagonist in the form of an entry level Buddhist monk who can talk with the dead, the muscle of the group who can locate corpses by dowsing, a skilled embalmer with an eye for detail, and a guy who channels aliens via a puppet. At the head of the Corpse Delivery Service is a tech savvy upperclassman with an eye for business and a tragic past. Although they often find themselves with little or nothing to show for their efforts, this rag-tag team does their best to do right by the dead and help them find peace. And hopefully make some money out of the whole process. Quite simply I haven’t enjoyed reading a horror manga this much since “Another” by Yukito Ayatsuji. “The Kurosagi Corpse Delivery Service” loosely follows the “monster of the week” formula in which our gang of misfits find a body, divine its wishes and then resolve its unfinished business. Mixed in with that are a lot of distinct but believable characters, and a creepy atmosphere that permeates every aspect of the book. The artwork is precise, with fine lines and soft tones used to create a visual look that doesn’t rely too much on special effect lines to fill in the background. The artist, Housui Yamazaki, has a terrific grasp of anatomy and is able to render distinctive looking characters via stern or sloping jaw lines, individualized noses, and unique fashion. No one can say this is a manga in which you can only tell who the main characters are by outlandish hairstyles and weird eyes. But what about the horror? What makes this series scary? “The Kurosagi Corpse Delivery Service” unsettles the readers in much the same way that a good monster movie does – nothing about the weird and frightening is ever fully explained, and the creeping something in the dark is never fully illuminated. You really get a feeling that the main characters don’t fully understand their powers and have no deep concept of what their skills can unleash. Why can one character talk to “aliens”? We don’t know. Who is the creature that appears over the monk’s shoulder whenever he speaks to the dead? No idea. Even the more mundane is drawn out and left only half explained. Why is Ao Sasaki, the talented business manager of the group, slumming at a mid level buddhist university? One can only hope that this will be addressed as her story continues to unfold. As the author explains at the beginning of the afterword on volume 2 page 214, people have been desensitized to corpses thanks to the enormous quantity of zombies in popular culture. So in order to make a horror manga that is actually disturbing he focuses more on characters with the animated corpses being left to the climax of the story. I have to admit, is it punchy that way. “The Kurosagi Corpse Delivery Service” is readily available in all major bookstores and in many comic book shops (ask them to order it via Diamond and you should be golden). It being a Dark Horse publication the paper quality is your standard recycled pulp, but on the plus side the covers are masterpieces done with textured paper in a variety of matte colors rather than the usual high gloss finish. Like many companies, Dark Horse provides leaves in the original Japanese sound effects with an explanation of all sounds at the end of each volume. Interestingly Dark Horse goes a step beyond by explaining the use of sound effects as elements of the artwork, as well as the origins of the language used to express each sound. It’s a fun read for anyone who ever wondered why different places have common sounds written in different ways. The main bullet point of this article would have to be that you should be reading this series. It’s weird, it’s creepy, it is both a strong mystery series as well as an effective horror series, and the artwork is a real treat to look at.